News Tidbits 2/21/15: Can’t We All Just Get Along? 1. 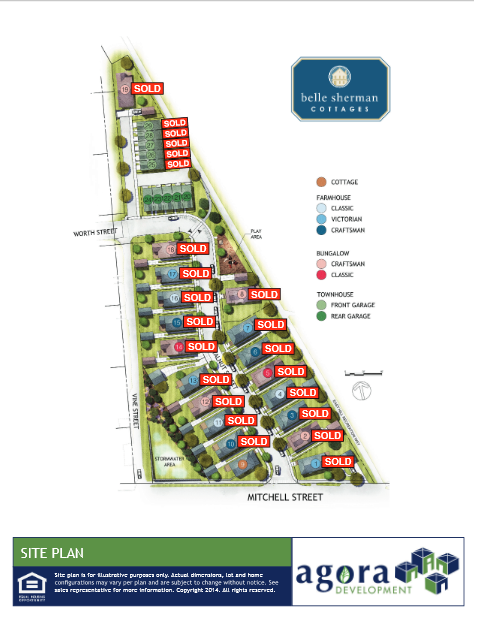 Looks like marketing has started for the second set of townhomes in the Belle Sherman Cottages project. Local real estate listings have two of the yet-to-be-built townhouses listed for $275k and $310k. The base-equipped units have 2 bedrooms, 2.5 bathrooms, and 1,325 sq ft of living space. 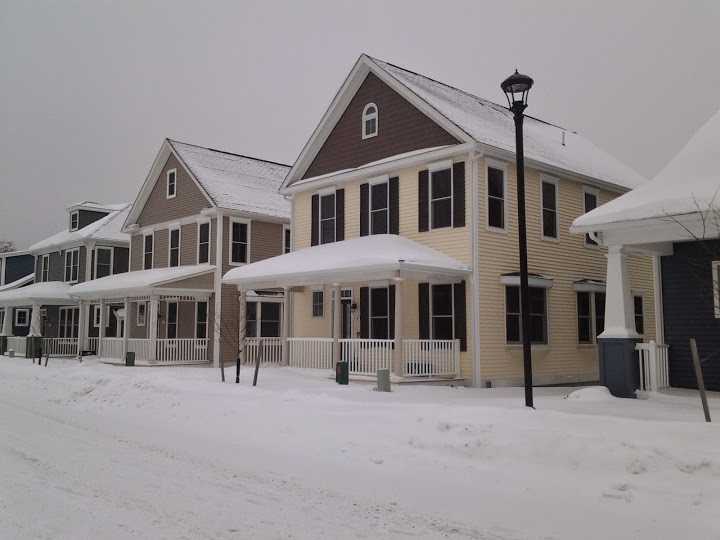 Unlike the first set of townhouse units, these units have the garage in the back. The first five townhouses have sold out and are ready to begin construction when the weather permits. This second set of five, lots 20-24 (aka the 200 Block of Walnut Street), will likely see construction later in the year, depending on how well the sales go. They probably don’t need to worry, the first set sold out in a matter of weeks. 2. For those that haven’t seen it, the Ithaca Times did an excellent piece this week regarding the murky political issues with Jason Fane’s 130 East Clinton project. Readers may recall that the project applied for tax abatements, but was rejected by the county IDA. The argument is that there was political interference with the decision, and the interference has been masked by statements incongruous with the CIITAP application process (ex. saying that the project was rejected for not being mixed-use, which is not a stipulation in the CIITAP application). The Times builds a pretty significant case that politics are infiltrating the process, manifesting as last-minute demands, and threaten to cut off development in downtown Ithaca, where land values and more stringent community demands make projects more expensive. Nathan Lyman, Jason Fane’s lawyer in the Clinton matter, has sent a letter to the city with his criticisms of the way program and the way local officials dealt with the project; an online copy can be found here. 3. Some minor tweaks to the 6-unit, 18-bedroom 707 E. Seneca project: basement windows to try and break up the monotony of its concrete block base. 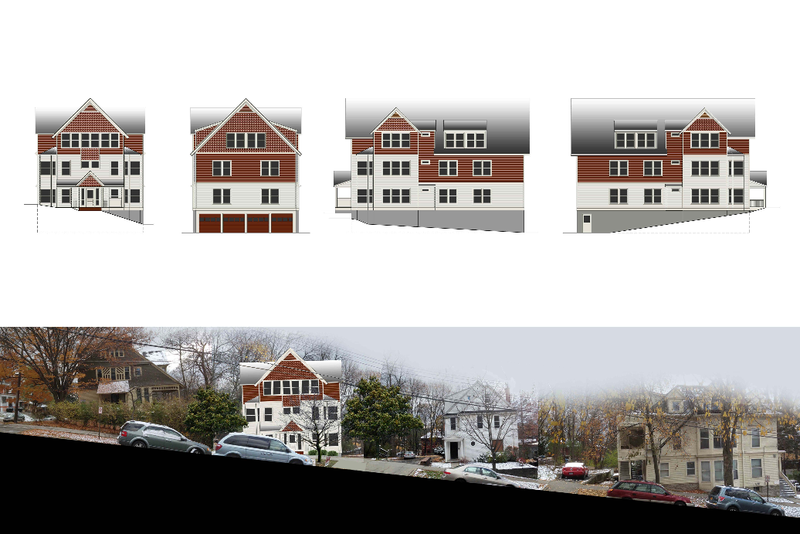 Apart from that, the color descriptions, facade details and finishes look to be unchanged from the earlier plan (first image). 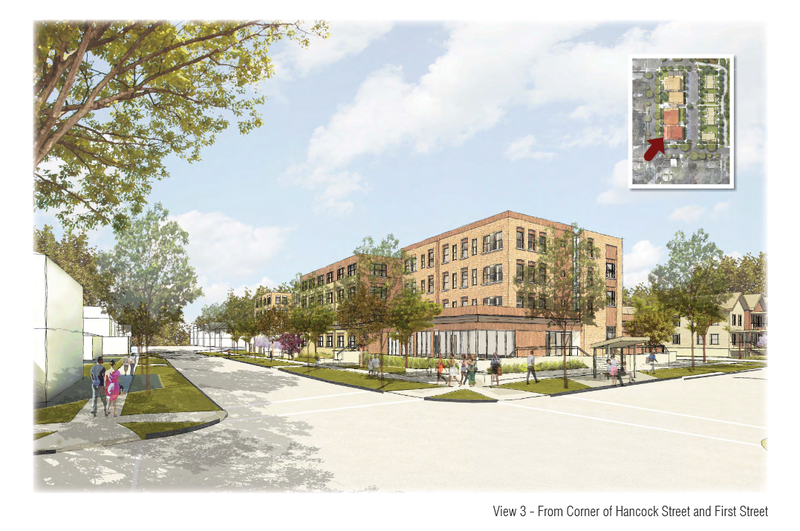 The project, planned for a vacant parcel that was one an abandoned school playground, is due to receive final site approval at next week’s planning board meeting. 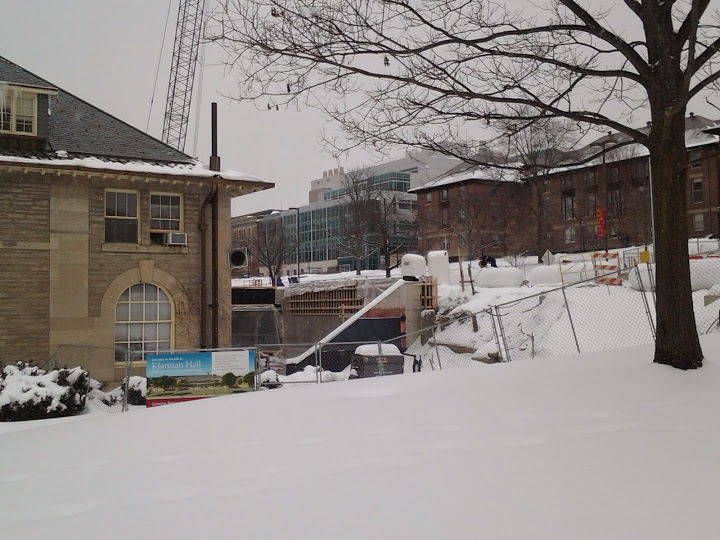 Developer Todd Fox hopes to have the project complete in time for the 2015-2016 academic year. – A. More talk about the Marriott signage – Marriott corporate wrote in to say that they’re not going to change their rooftop corporate signage just because Ithaca wants to be unique, but they are open to shrinking it so that it’s less prominent. The hotelier also said they would be open to some degree of “interpretation” with the street-level signage. – B. Final Site Approval for the Canopy Hilton – This might be delayed again due to a potentially huge problem on the horizon. The CSMA (Eagles Building) next door sent a letter opposing the use of its rear parking lot for a utility easement by this and the Carey Building, because it could hamper their own theoretical expansion plans. In the letter, they have said they would allow the easement if they get to take the land between them and the Carey Building, which is what the Hilton intends to use as their driveway. 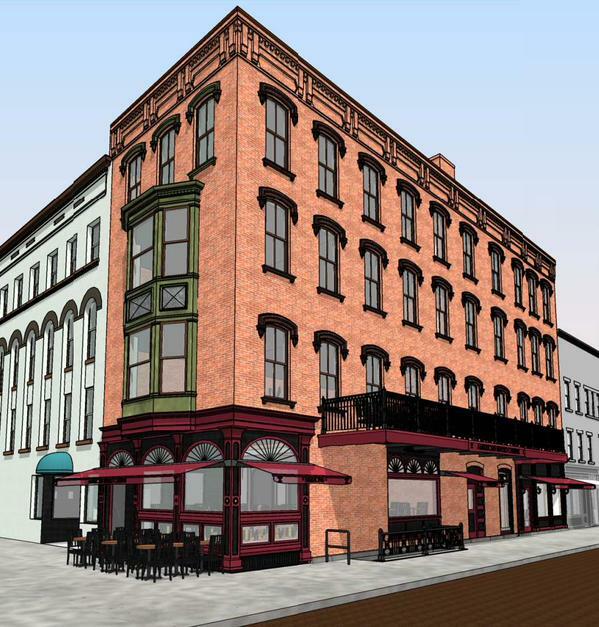 It would be a major rearrangement of the Canopy site plan (and potentially prohibited by the city’s transportation engineer since E. Seneca is one way), and these moves by the CSMA could impact work on the Carey Building as well. The city already granted an easement late last month to the Carey Building for the municipal parking lot between CSMA and the Carey Building, and work’s already begun, so it’s unlikely that parking lot’s ever going to be reopened. Everyone loses. I can’t tell who at the moment, but considering the Carey and Hilton projects have been under review for nearly a year, the timing of this is awful, someone really botched up here. This could be a very nasty fight. Let me grab the popcorn. 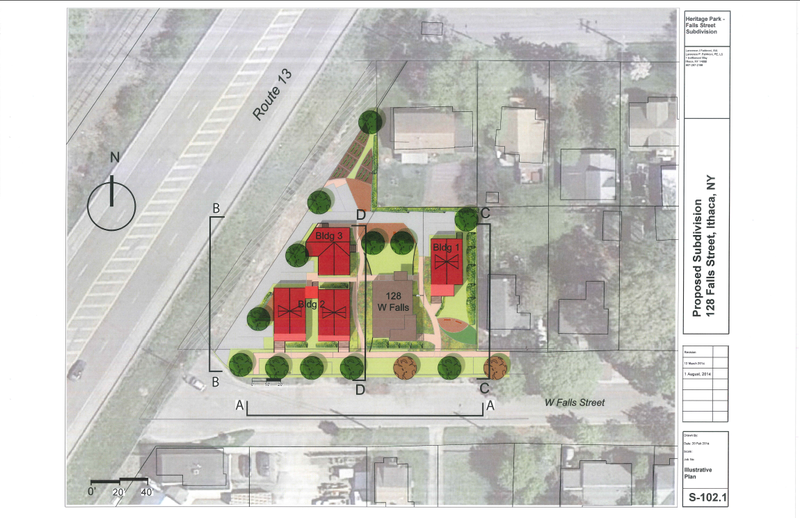 Subdivision review will also take place for the duplex proposed behind 424 Dryden Road, and paperwork has been filed for another subdivision to create a lot for a new single-family home (203 Pearl Street) by slicing off the north portion of 201 Pearl’s lot. 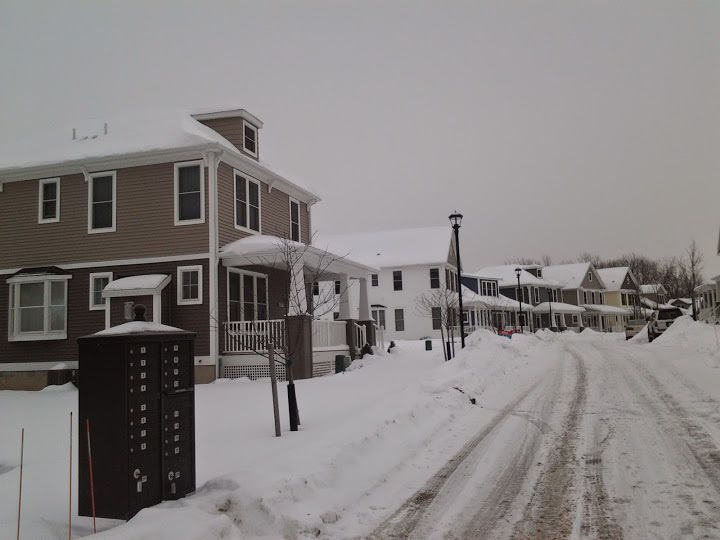 The Pearl Street subdivision won’t be reviewed until the March meeting. 5. Another Ithaca Times piece, this one about strong opposition to a proposed expansion to a spiritual wellness/meditation center on Turkey Hill Road. the expansion calls for 10-12 beds for overnight visitors, but neighbors are fiercely against it for noise and traffic concerns.The architect for the expansion is Noah Demarest of local firm STREAM Collaborative, but there’s no renders of the proposed expansion on the website just yet (but their website is updated pretty regularly, so it’s only a matter of time). Good heavens. This is one of those weeks where it seems everyone in Tompkins County hates everyone else that lives in Tompkins County. Back in August, I wrote a story about how a student competition was held in the early 1980s to design the mixed-use building currently standing at 409 College Avenue. It appears that someone liked the idea and decided to launch a competition of their own. 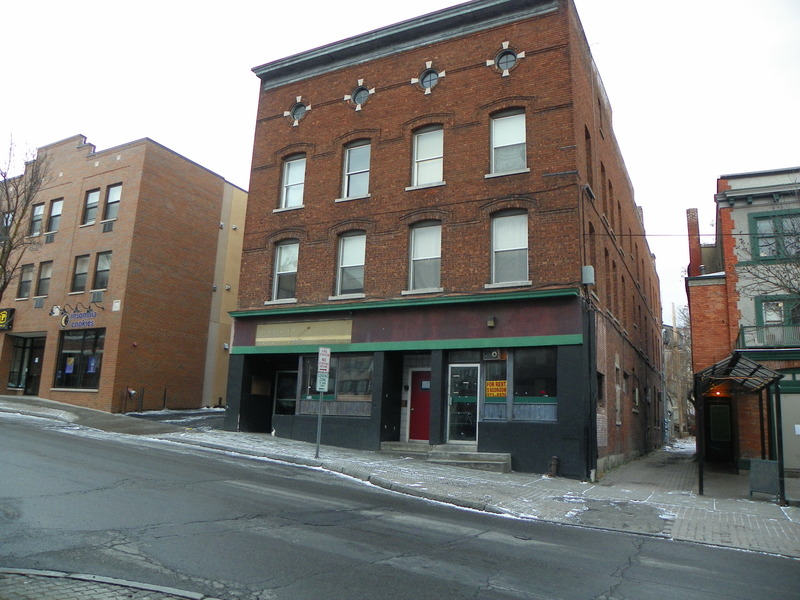 According to the Cornell Daily Sun, the competition is to design a replacement for 313-317 College Avenue, a property owned by local developer/landlord Lambrou Real Estate since the late 1970s. 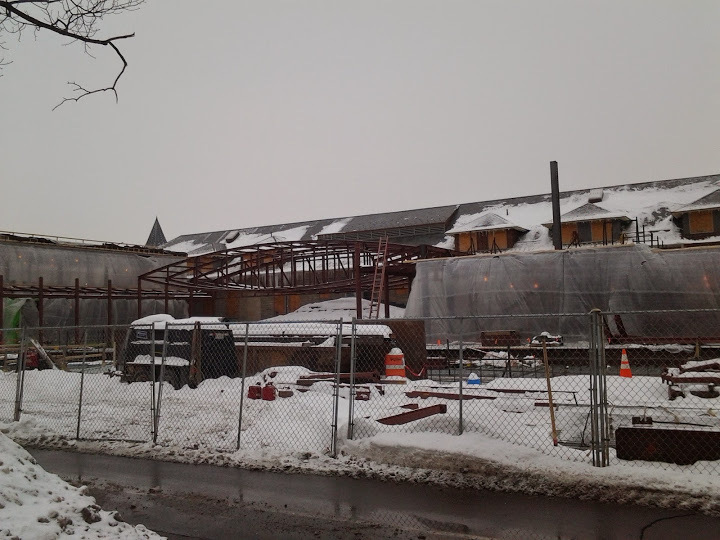 Cornellians of my late 2000s vintage will remember this building for housing Dino’s Bar and Grill. In previous years, it’s also held a grocer (1920s), a furniture store (1950s), a record store (1970s), and the Cosmopolitan Restaurant (1990s). Finding the original construction date of the building has been difficult (I’d guess ca. 1910, since it’s missing from this 1906 photo but it’s definitely an older style), and it appears substantial renovations occurred in the mid 1970s, likely the porthole windows on the fourth floor. Because of the heavy alterations borne by the storefronts and top floor over the years, the building has lost much of its historic value. From a zoning standpoint, the building is in the densest Collegetown zone, MU-2. 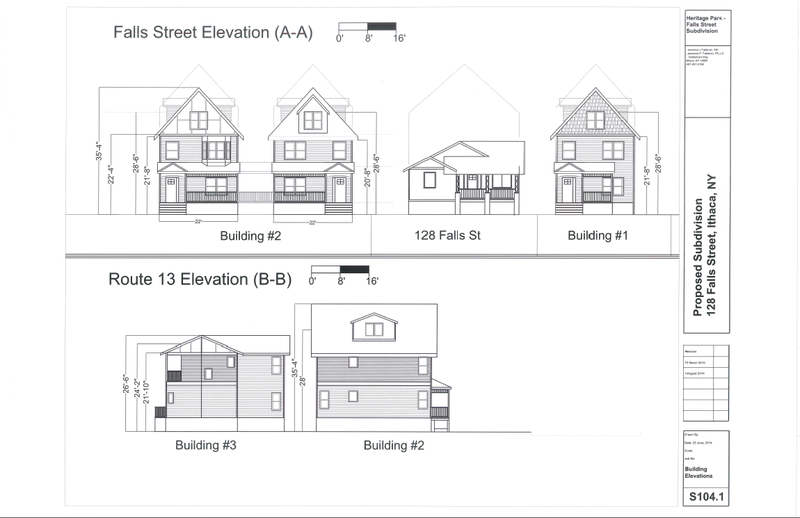 That entails a mandatory mixed-use component (usually interpreted as commercial space on the first floor), the building can occupy almost all the lot except for a rear setback of 10 feet, and no required parking. The building must be between 4 and 6 floors, and 45′-80′ tall, with a flat roof. 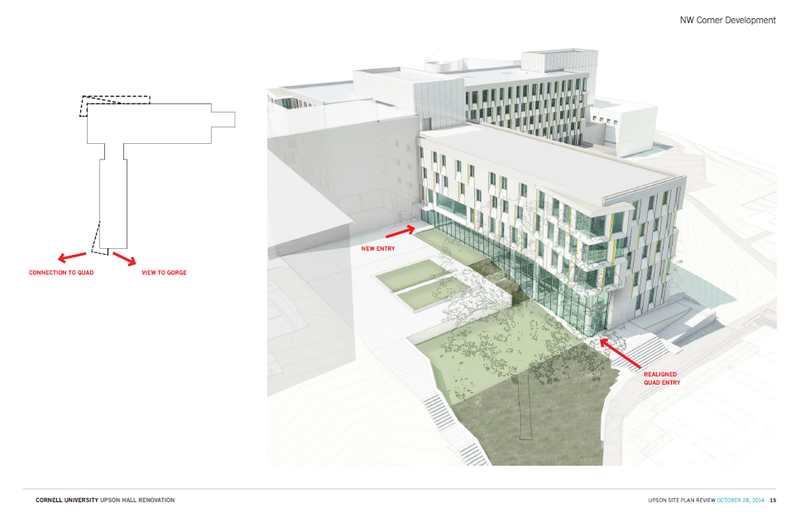 313-317 College already occupies most of its lot footprint, so the area of the new building wouldn’t be a big change, but the addition of a few more floors would make for a greater visual impact. More likely than not, there will be student apartments from floors 2-(4 or 5 or 6). Speaking specifically about the competition, it’s open to any member of the Cornell community, student, faculty or staff, and has been underway for a couple weeks. Sketch plans were due Wednesday the 18th, final plans/schematics April 7th, and the winner will be announced May 17th. The call for proposals asks for sustainability as a design theme, so an emphasis on “green” features is expected in the submissions. The judges panel will consist of Lambrou Real Estate, AAP professors yet to be chosen, and Ithaca Student Housing, which is also staffed by the Lambrou Family (different branch maybe?). No word yet if there’s a cash prize for the winner. Just like 409 College over 30 years ago, this is a win-win for everyone involved. The winner gets exposure and a pretty big project to claim on their resume. The Lambrous get a project at a fraction of the design cost of an architectural firm. I hope to see and share some of the proposals as they become available. 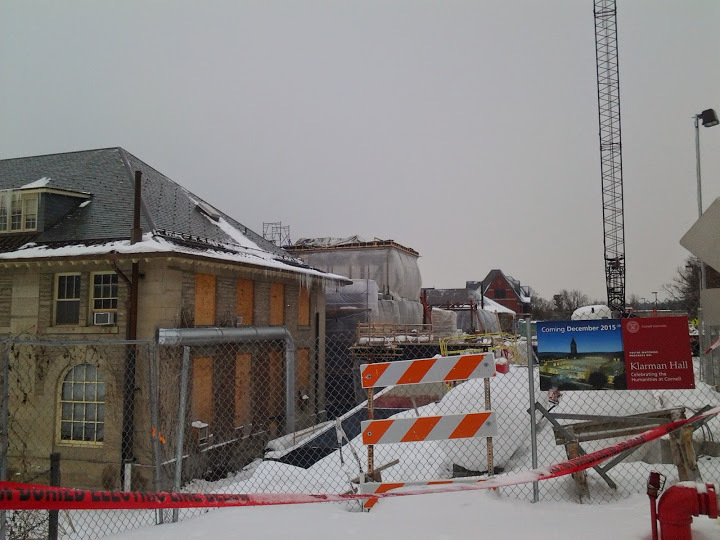 Time to take another look at Cornell’s Klarman Hall for a progress report. 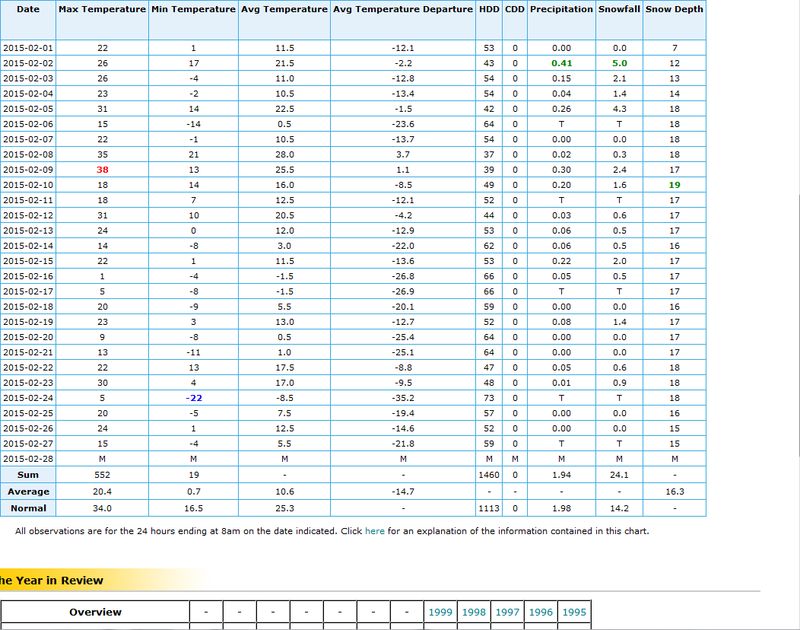 It was low 50s F when I stopped by in late December and I thought that was pretty awesome. I completely and totally regret saying anything and will next time reserve to complaining about how cold it is, in an effort to spite Mother Nature. 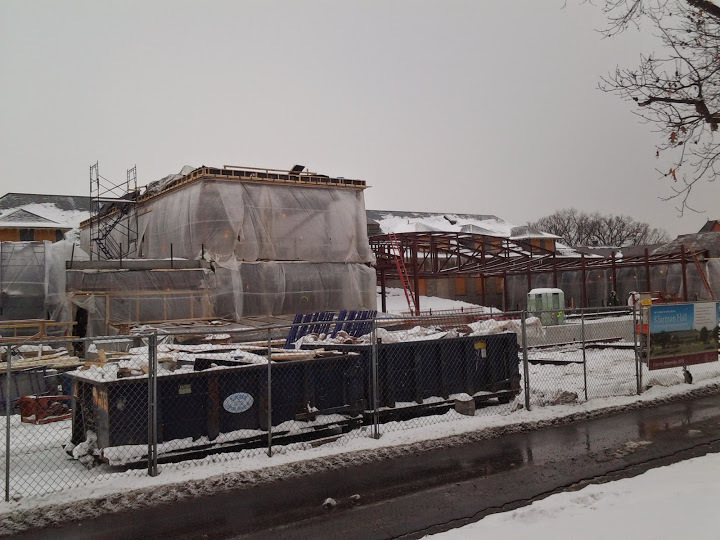 Anyway, construction firm Welliver has been busy craning the new steel atrium trusses into place, with at least four installed when these photos were taken the weekend before last. My laymen’s mind would call the shape almond-like or a pinched oval, but wikipedia tells me the proper terms are “vesica piscis” or “mandorla”, both of which sound like alien species doing battle with Captain Kirk. 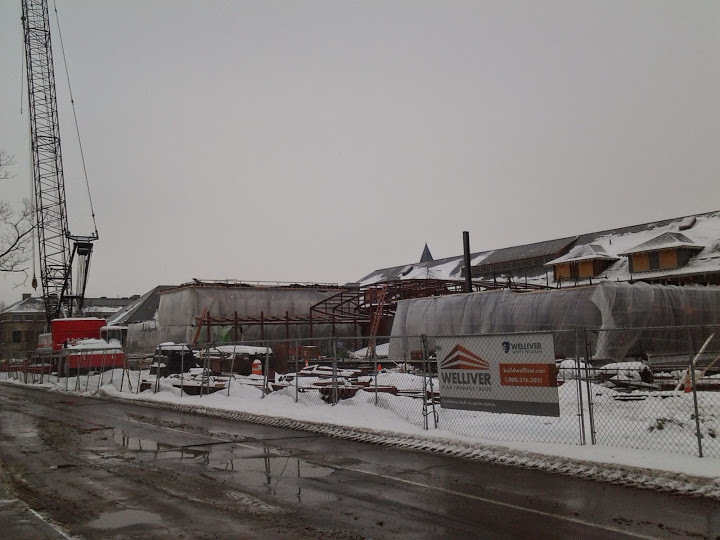 One of the site cranes has completed its work and has been removed, while the other will stay in place until all the structural steel has been erected. On the lower floors, fireproofing, mechanical and electrical rough-in (plumbing and wiring) is underway, while concrete pouring is taking place in parts of the upper levels. Some of this work would be visible from the fences, were it not for the plastic sheeting put up to keep the frigid winds at bay. 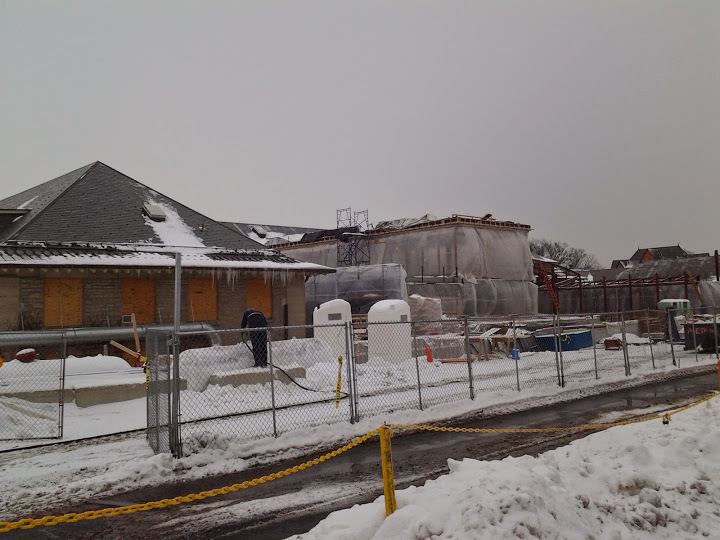 Over the month of February, construction schedules indicate that fireproofing will wrap up on the south side of the ground level, leading the way for sheetrock installation and exterior and interior wall framing. At the same time, fireproofing will begin on the north side of the ground level, and concrete will continue to be poured for the auditorium space and upper levels. The 33,250 sq ft building was designed by Koetter | Kim & Associates, and is due to open in December 2015. Construction cost is estimated at $61 million. 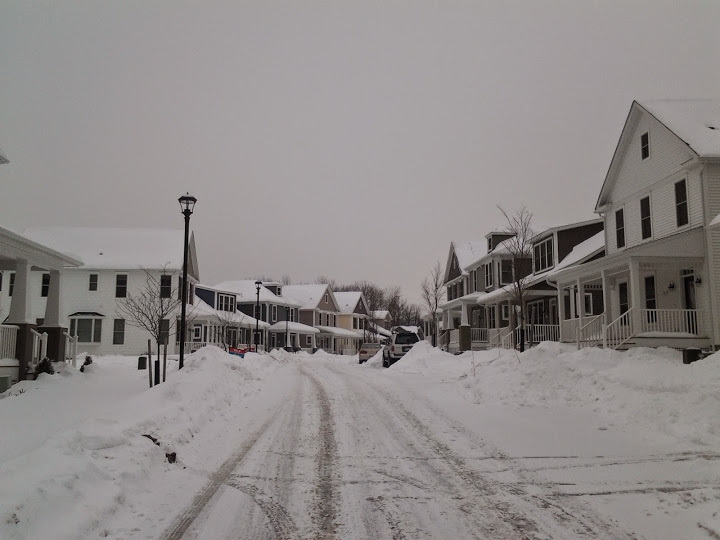 It feels a little surreal to be walking down Walnut Street (fun fact, there was originally a Walnut Street plated for Ithaca’s West Hill in the mid-1800s) and have it fulled out with homes on either side. Yet that is indeed the case. It’ll be easier at this point to count what’s not yet built in the Belle Sherman Cottages development – the townhouses (10 total, 5 due to start this Spring and 5 yet to be marketed), the new cottage design for the not-yet-marketed lot 9, and lots 11 and 12), which are sold and probably awaiting the arrival of warming weather before the foundations are excavated, poured and CMU block is laid. Heck, they might already be poured, but hidden under several inches of snow. 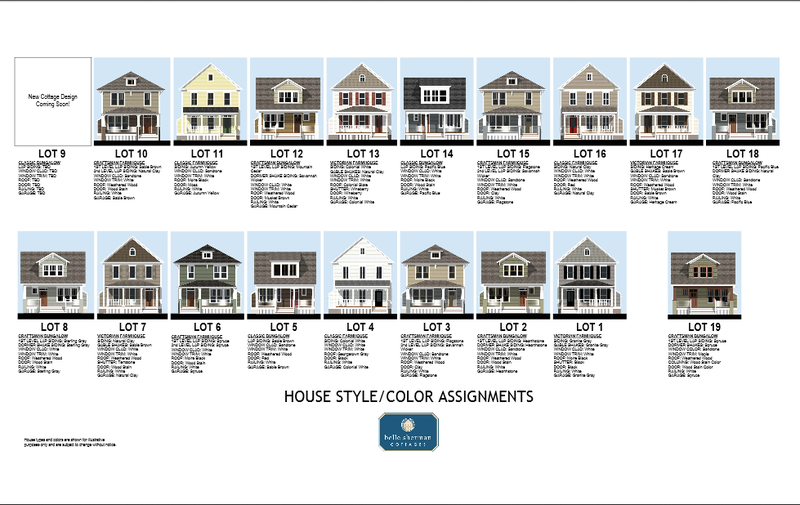 So 16 of the 19 houses are built, with a couple of those, like lot 17, undergoing interior finishing and still in need of a little porch/column paint work before being turned over to their new owners. If you’re interested in learning more about the construction process, there’s a little more info in my previous post here, and on Ithaca Builds here. Every couple of weeks, another sale shows up in the county property records, typically in the range of the low 300s to low 400s. 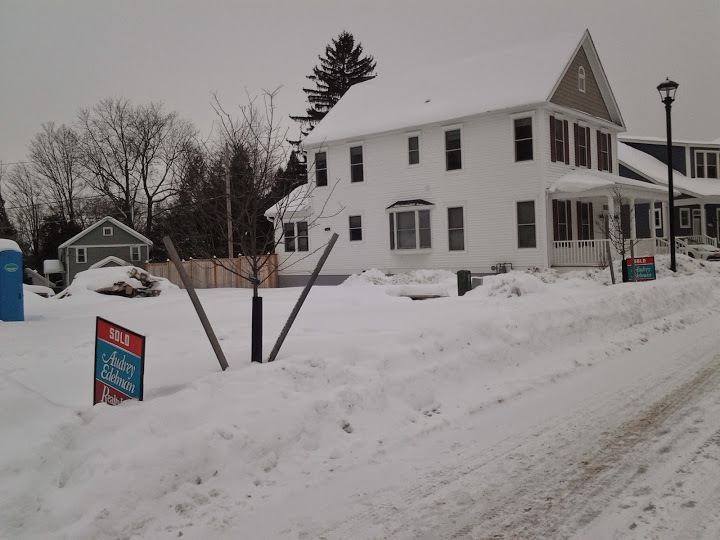 Formal sale isn’t happening until a house is move-in ready (I suspect that while underway, a “sold” lot is actually reserved with a down payment), so following the county’s record of transactions is a useful indicator of progress. 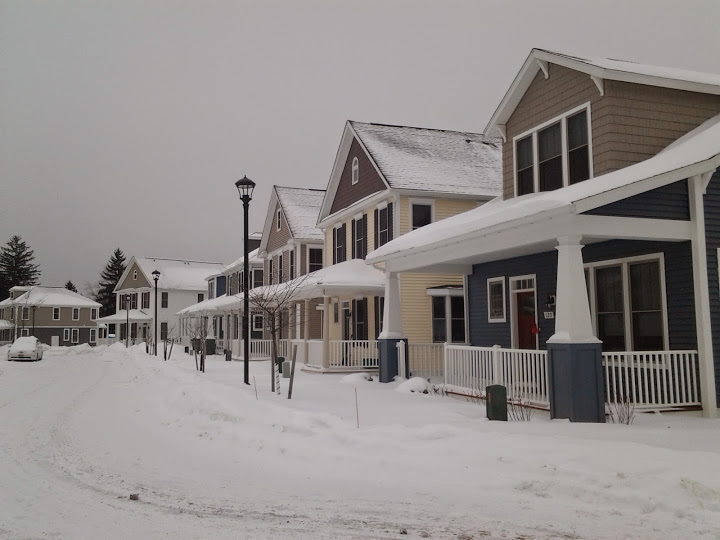 According to the Belle Sherman Cottages facebook page, Skaneateles-based Agora Homes and Development intends on completing the 29-unit development in 2015. Veering into editorial territory here, I’ll admit that I was pessimistic about the project early on, thinking it was too much money for what was provided. 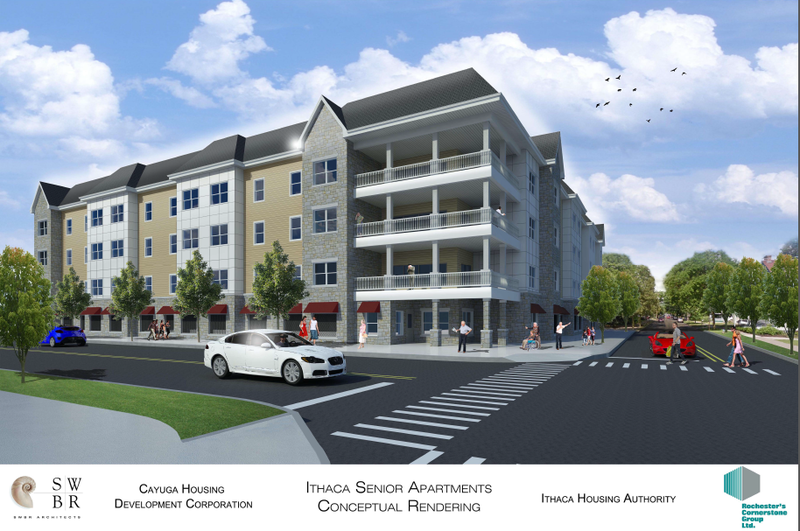 But in retrospect, I think this is the right type of single-family housing for more suburban parcels, such as other sites in Ithaca town near the city line. Much of the zoning locally is designed to favor of large lots and large price tags. I wouldn’t call these affordable by any stretch, but they’re somewhat closer to the median value than most other single-family homes going up. Being this close to Cornell also adds a premium on their price tags; perhaps on a site in South Lansing or South Hill, they’d be somewhat less expensive. They’re a good (better?) 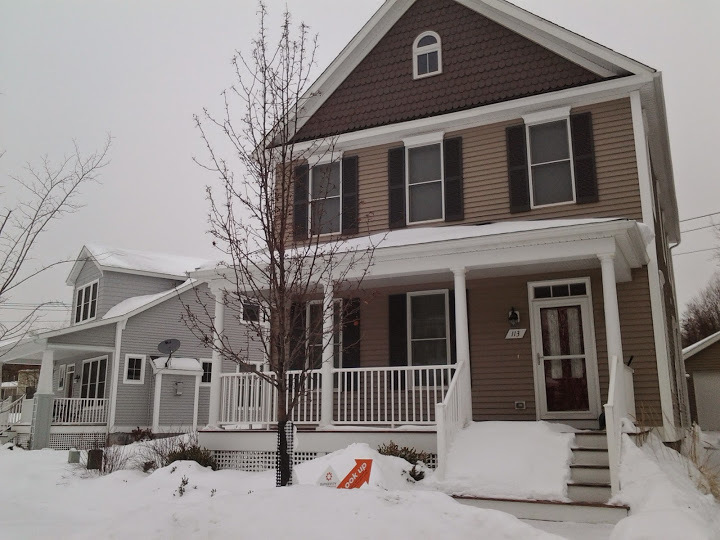 alternative to the sprawling cul-de-sacs that seem to be the norm for housing developments in suburban Tompkins County. 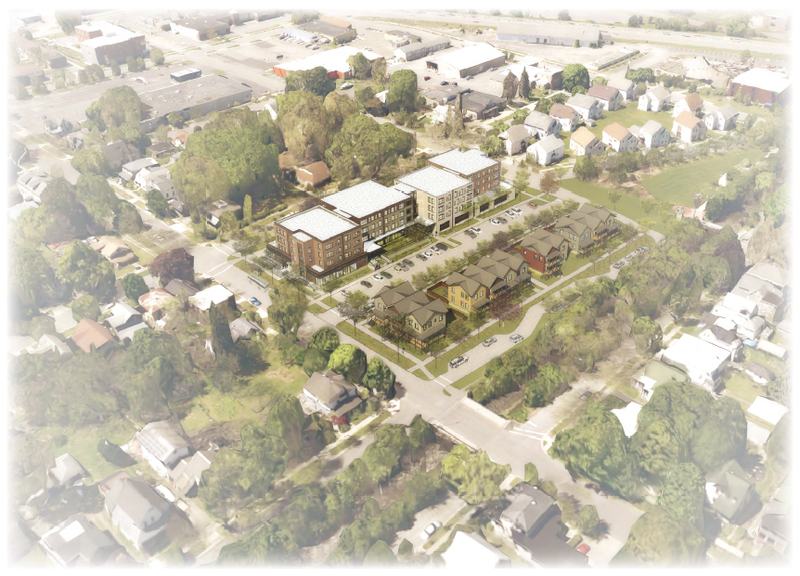 I think that, in the same vein of this project, though with more of a “green” sheen, the Amabel site in southwest Ithaca will be the next single-family development worth watching. Avid readers will note that I’ve been writing about the Neighborhood Pride site on the Voice, keeping only brief notes here on Ithacating until a final design was unveiled. Now with that taken care of, here’s a description of what we’re working with, based on documents filed with the city on February 13th. There’s a brief application summary and cover letter here, or the 764-page FEAF (Full Environmental Assessment Form) here. I swear, no one reads those giant PDFs in their entirety, users only look for specific sections based on their prerogative. The rest is just there for gluteus maximus coverage. Perhaps a little bit to my dismay, the project is not going to be complete until September 2020, tentatively. This isn’t a huge surprise though, INHS is a non-profit and dependent on grant disbursements. The buildout will begin in September 2016 and consist of three phases – my guess of the breakdown is the townhouses are one phase, the 2 southern apartment buildings are a second phase, and the northern two apartment buildings are the third phase, though not necessarily in that order. 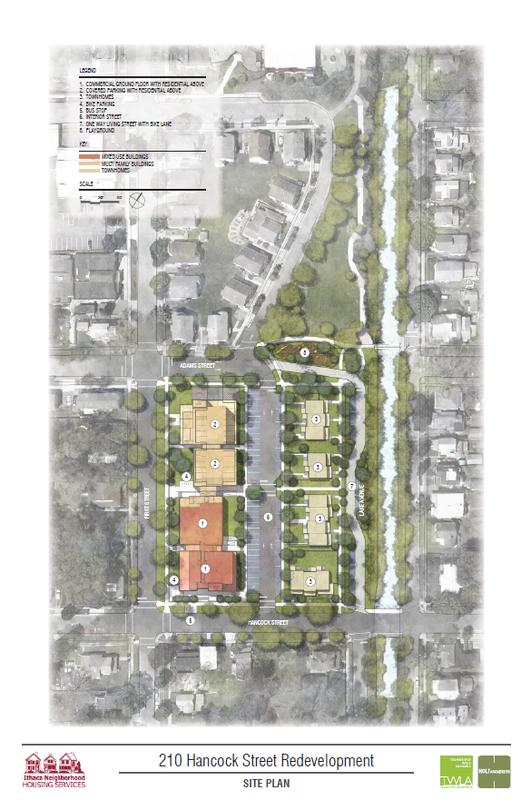 At some point, INHS anticipated subdividing the parcel into apartment and for-sale portions, which might be useful when applying for affordable housing grants. 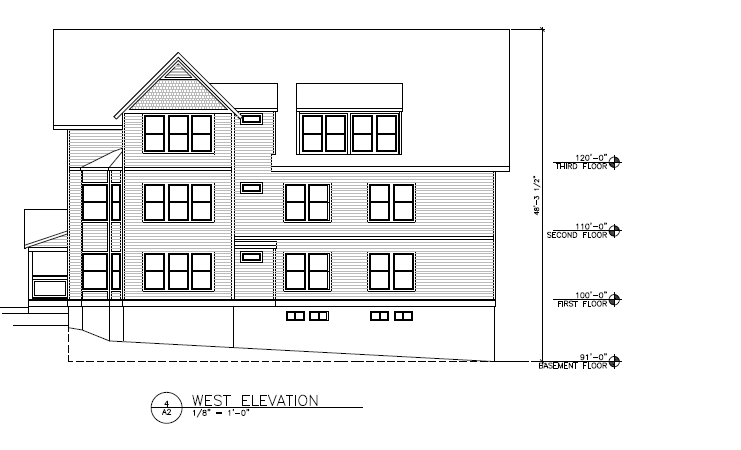 The apartments call for ~50 1 and 2-bedroom units, and 13 for-sale townhouses, although it still looks like 12 in the renders (who knows, maybe one is a small duplex). So about 63 units total, and about 8,200 sq feet or rentable commercial space in three spaces (proposed at 1,800, 2,500 and 3,900 sq ft, for a total of 8,200 sq ft). 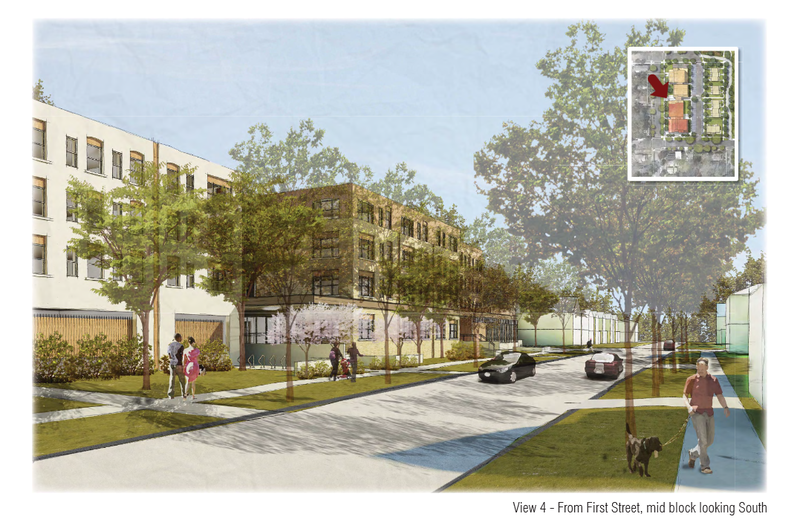 The apartment buildings will be 65,000 sq ft, 4 stories and 48′ tall (zoning max 4 stories/50′). The demolition of a one-story office building (built 1975) and a vacant grocery store (built 1957) will be required. Total construction cost is anticipated to be about $13.8 million. Interestingly, what looks like the community favorite (the street scheme) doesn’t read as the county’s favorite (which reads as the alley scheme). But the county only advises, the city decides. Lake Avenue will be what they call a one-way “living street” – a low-speed, low-capacity street shared by bikers and vehicles. With those features, it’s designed in a way that you’d only drive on the road if you live in one of the townhouses. Conley Park’s southern boundary will be opened up to flow freely into the property (it was blocked off with vegetation to begin with because of its proximity to the old P&C loading dock, which made for a loud, smelly experience). As an honest personal opinion, the design – inspired by local 1900s industrial and manufacturing buildings, according to the application – is pretty nice. It’s contextual, it’s appropriate, it fits in without being a total historical throwback. The townhouses are well-designed as well. I think INHS’s willingness to have heavy community input, and the community’s willingness to help shape the project, really came together to create a nice product. 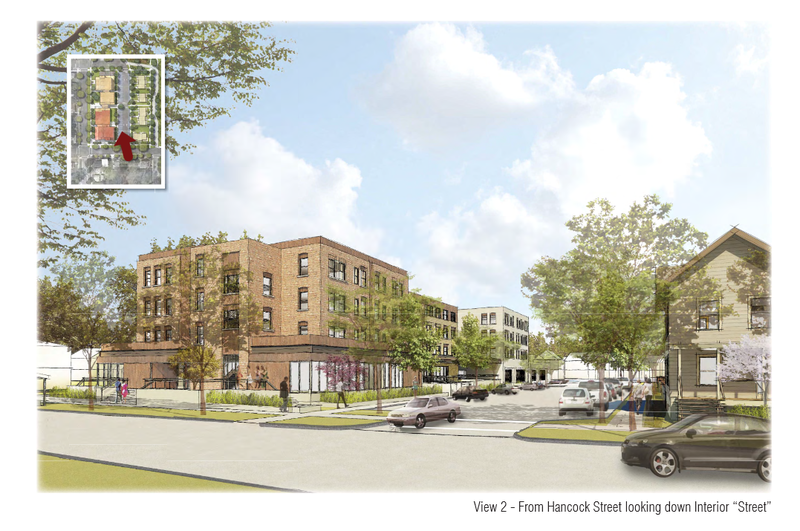 A parking variance will be required from the city – the site will have about 70 parking spaces, but zoning requires 86. Will a new TCAT bus shelter and on-street parking nearby, INHS anticipates that they will be able to obtain the parking variance without too much hassle. 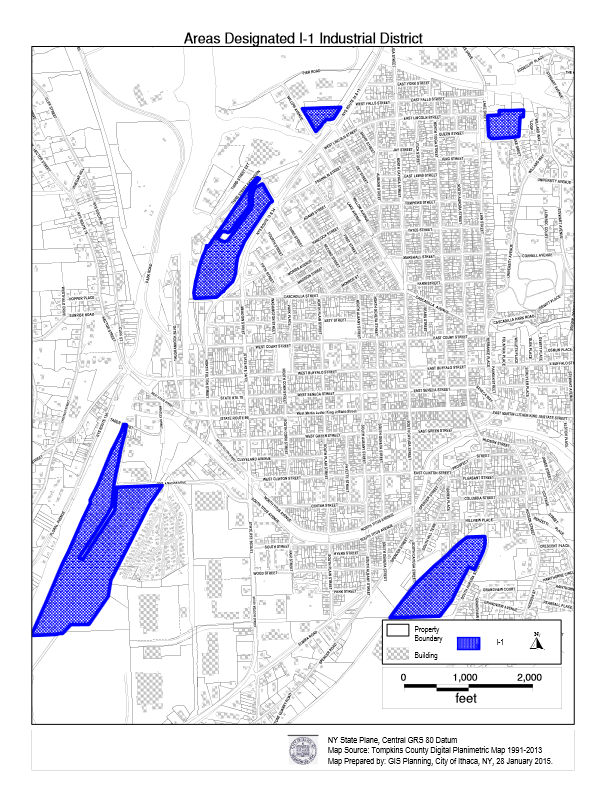 INHS also needs to be be mindful of the flood zone, which they seem to have accounted for in the site plan. The only portion of the site especially vulnerable to a 1-in 100 year flood event has covered parking on the first floor. 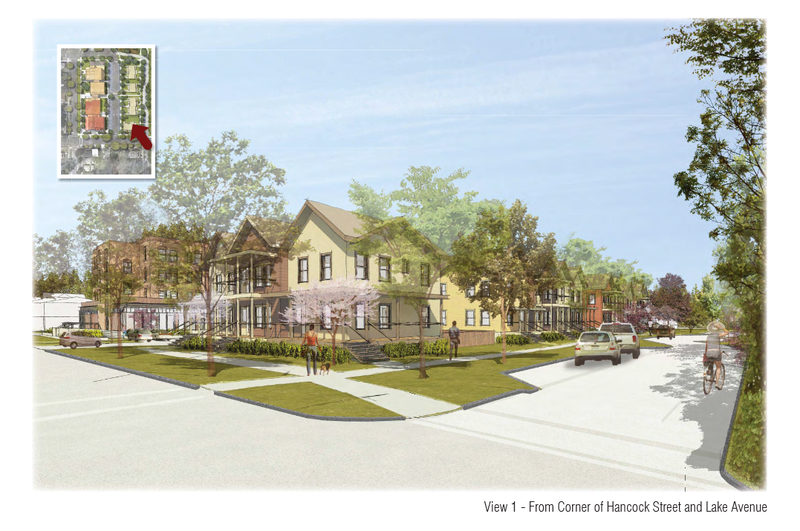 The townhouses, which are in the 500-year zone, will be built two feet above the ground, and the commercial space, also in the 500-year zone, will be one foot above the ground. In sum, we have a project that removes a vacant supermarket, fits well in the urban fabric and provides affordable housing. It might take forever and a day to build, but it’s a welcome resource in the city of Ithaca. 1. 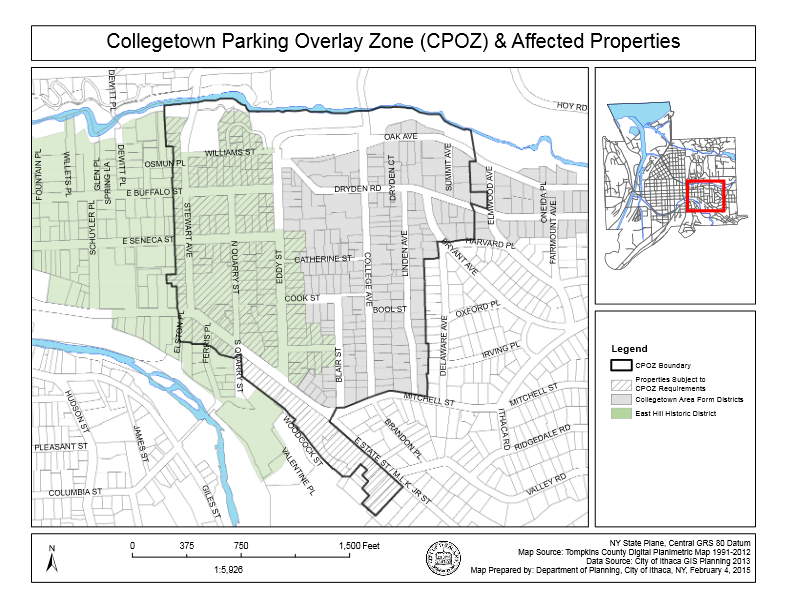 Leading off for the week, here’s an interesting piece of news: the city is set to repeal the Collegetown Parking Overlay Zone (CPOZ). The CPOZ was enacted in 2000 as a way to control the parking needs of Collegetown – essentially, it mandated more parking spaces per unit than was standard for a parcel’s zoning. 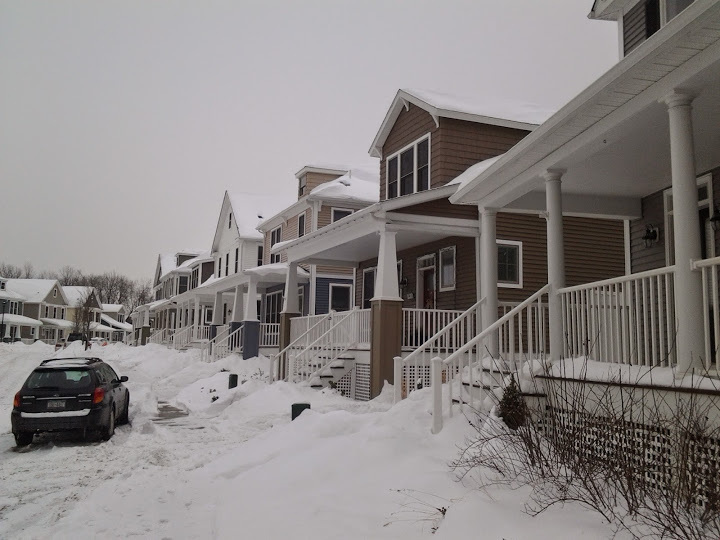 For example, an apartment building of 6 occupants, zoned R-3a, would require 2 off-street parking spaces in Fall Creek, one for every three residents. But on East Hill, that same building would require 3 parking spaces, since the CPOZ mandates 1 off-street space for every 2 residents. At the time, it made sense; East Hill tends to have more students, who bring their cars to school. But in the past 15 years, the proportion of students bringing cars has declined substantially – a study by Randall/West indicated that in 2000, 49% of Cornell students owned a car; by 2012, it was 27%, a change attributed to the rise of alternative transportation (car share, Cornell-subsidized bus passes), economic and cultural changes. At this point, there’s more parking than there is necessary. It may seem at first glance that the CPOZ was eliminated with the Collegetown Form Zoning enacted last year, but the two maps don’t match up completely- there are 145 properties that weren’t affected by the new form zoning, but are still covered by the CPOZ parking requirement (see map above). Nearly all of these parcels are a part of the East Hill Historic District (the rest being Collegetown Terrace). 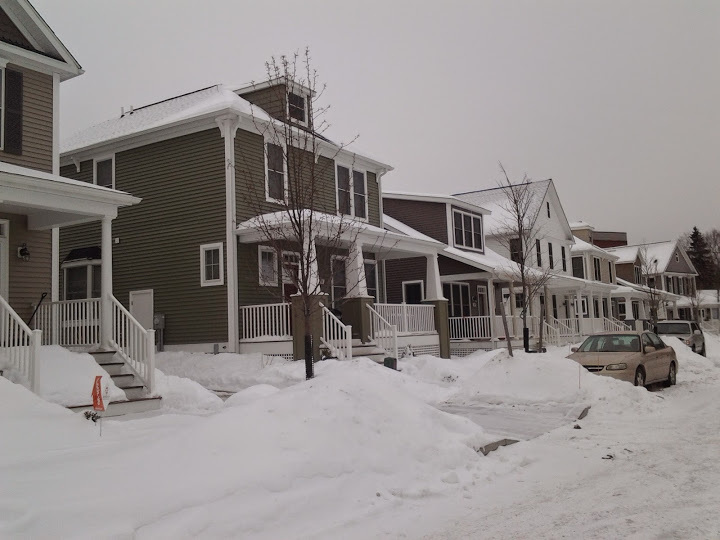 A few recent cases, one with Collegetown Terrace and a couple of smaller projects, have highlighted the point that parking requirements have become excessive. A change to the parking requirements could have a couple of desirable effects – one, less parking would be more historically accurate, and helps to preserve green space in the neighborhood. Two, it opens the idea of replacing a couple of the current parking lots with new housing, which would be designed to fit in closely with the current building stock since the properties are located in the East Hill Historic District (I know, landlords will never give up the money from renting spaces, but perhaps a new small apartment house might be more lucrative than a parking lot; looking at the tax maps, there are a few possible sites, including subdivisions). 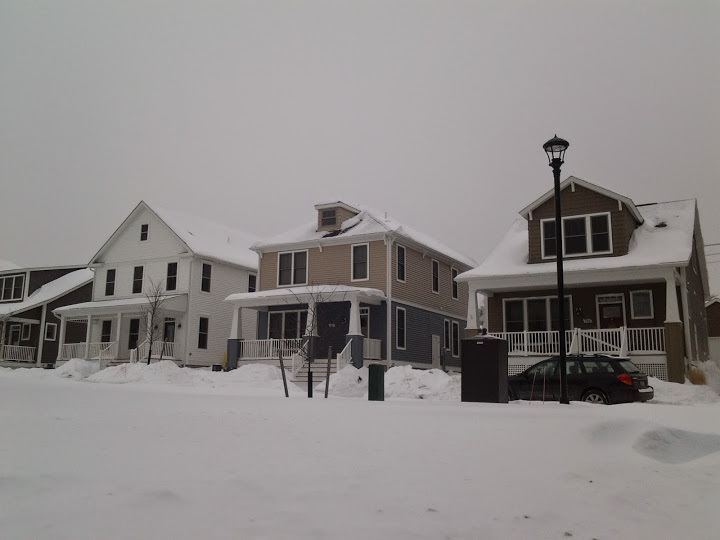 One mixed effect would be that it’s easier to convert a current single-family lot to student rentals, but the rental would now be less visually intrusive with fewer parking spaces. It’ll be interesting to see what comes forth as a result of this zoning repeal. 2. Among other zoning changes being considered is a change to industrial zones (the city has just a few). Commercial buildings can be built in industrial zones, but the city wants to raise the minimum number of floors for new commercial buildings in these zones to increase from 1 to 2 floors, a nod to the paucity of undeveloped land in the city (and perhaps the painful attraction of suburban big box stores). There are five sites on the map above, but it might as well be three – Emerson (lower right) is becoming a planned development zone, and the Ithaca Gun site (upper right) is expected to be rezoned from industrial to medium-density residential, in preparation for an apartment project still in the works. 3. What is up with the proposed hotels constantly delaying their schedules? First the Marriott pushed back its opening from Spring 2016 to Q3 (July-September) 2016. Now the Canopy Hilton is pushing their schedule back, from a construction start this Spring to an autumn start, which makes it difficult if not impossible to realize the cost savings from reusing the crane for the Carey Building. The tax abatements aren’t going to take that long to obtain, maybe another month or two before the county takes its vote. Presumably, the project would open in autumn 2016 if the construction schedule is similar. But I feel like these delays send a message of incompetence, and that’s the last thing a project needs. 4. Maybe the article I wrote about the new INHS project will have run in the Voice by the time this auto-publishes. 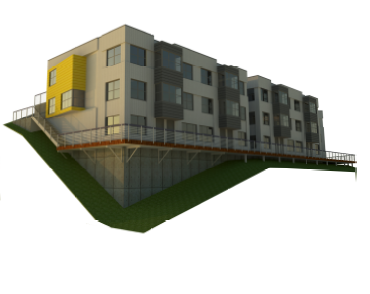 But here’s a render that I decided to leave out of the final article to minimize space. The city uploaded the initial application Friday morning (sketch plan will be presented this month), and I’ll write a follow-up article, based on the application paperwork (so it will be different from the Voice article), and post it here on Ithacating in the next few days. 5. 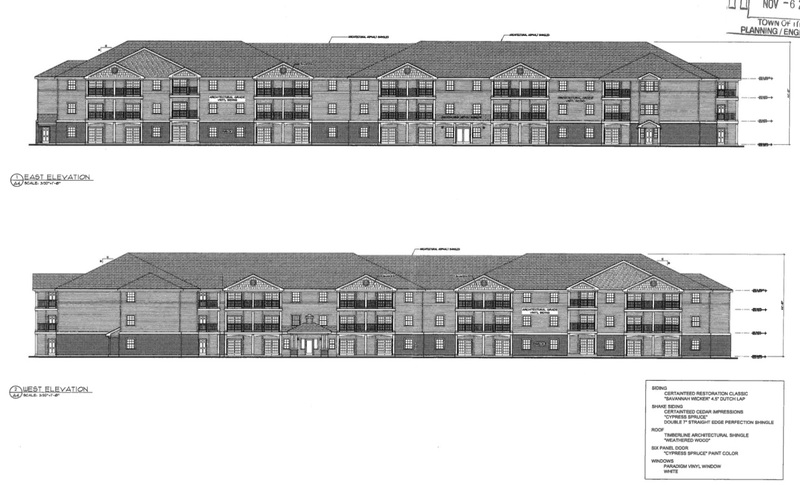 Staying on the topic of affordable housing, these agenda notes from IURA Neighborhood Investment Committee reminded me of another affordable housing project that totally slipped off the radar- Cayuga Meadows, a 62-unit apartment building for seniors that was approved by the town of Ithaca for a site near Overlook at West Hill in late 2012. On page 52, it’s noted that the project is supposed to open in November 2015. That would imply that it should be starting construction soon if site prep hasn’t started already (I haven’t visited the site in over a year, so I have no clue). The pipeline document is dated from February 2014, so I have no idea if that’s still accurate. 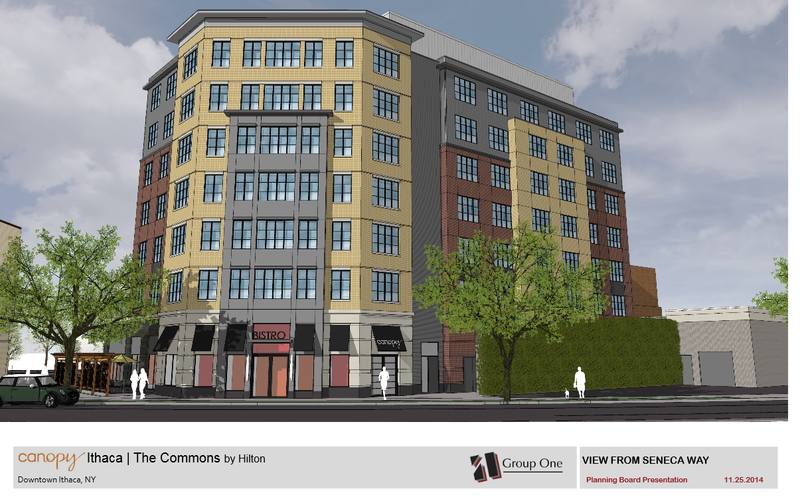 I emailed its developer, Conifer LLC, to see if the project was active, but received no response. Still, it’s something to keep an eye on.